The 1886 Crescent Hotel and Spa has a rich and fascinating history. On the Hotel's Fourth Floor, one finds the hotel's historic archives. Here guests can read about the earliest accounts of the hotel from stories taken from the Eureka Springs Times Echo as well as view artifacts collected over the years. A unique collection of Crescent College as well as a Calliaphone from the Baker era is on display. When visiting the Crescent Hotel be sure to pick up a Walking Tour Book. This book is not only a great resource to learn about the history of the hotel but it is a perfect souvenir to take home. Pick your copy up today at the front desk for $3.50. 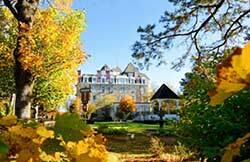 With the opening of the grandiose Crescent Hotel, Eureka Springs entered a new and exciting era. Notables from afar are arriving in our fair city and soon many others will follow. The Crescent, built by the Eureka Springs Improvement Company and The Frisco Railroad is America's most luxurious resort hotel. Featuring large airy rooms, comfortably furnished, the Crescent Hotel offers the visiting vacationer opulence unmatched in convenience and service. Tonight's gala ball will find in attendance many of the leaders in business and society. As guest of honor, the Honorable James G. Blaine, the Republican presidential nominee, will attend with his charming wife Laura. The very popular Harry Barton and his orchestra will play for tonight's festivities. In the Grand Ballroom of the new Crescent, the opening banquet for the 400 celebrants will be followed by a dedication ceremony where the honorable Mr. Blaine will be the guest speaker. His introduction by Mr. Powell Clayton will follow an invocation by Reverend McElwee. It was two years ago that Powell Clayton and his associates chose the site of the new Crescent Hotel.. twenty seven acres at the north end of West mountain, a majestic location overlooking the valley. The commissioning of Isaac Taylor as architect was announced and construction commenced. Seldom has such a formidable construction undertaking been accomplished with such efficiency. Special wagons were constructed to transport the huge pieces of magnesium limestone from the quarry site on the White River near Beaver. Due to the density of this special stone, and the precision necessary in cutting and fitting, a group of specialist from Ireland was brought here to assist and advise in construction. Mr. O'Shawnessey, the spokesman and leader of the imported group, was interviewed by this reporter before his return to Ireland. We recall that "Throughout the many years of his stoneworking, he has never encountered a stone with such density and quality as the White River Limestone". He predicts it will become a popular building stone in the future and further stated that because of its unique characteristics, the eighteen inch thick walls of the Crescent, fitted without the use of mortar, would withstand the destructive forces of time and retain its original beauty for many years to come. The magnificent structure was then furnished in the most exquisite manner. It is lighted with Edison lamps, furnished with electric bells, heated with steam and open grates, has a hydraulic elevator, and is truly a showplace of today's conveniences. Crescent Hotel - Perched on the crest of the Ozark mountains, this resort hotel in the old tradition is surrounded by the hilly town of Eureka Springs. Breakfest, lunch, and dinner served. Overnight accommodations and vacation facilities. Closed November 15 to April 1. Wash and drain huckleberries and sprinkle with 1/2 teaspoon flour. Sift dry ingredients and cut in shortening. To this add milk and beaten egg. Stir floured berries in quickly; don't mash them. Bake in hot greased muffin pans for 20 minutes in a moderate oven. (Blueberries can be substituted) Pop a batch into the oven for a Sunday morning breakfast surprise. In the spring of 1930 John Tunis’s wife Lula was dying of cancer. In his private moments he must have alternately begged God not to take his wife and cursed him for letting her suffer such a cruel end. By the end of May, Lula was running out of time. John placed her and their dwindling hopes in the hands of a man named Norman Baker. They prayed he could provide the cure that the medical establishment could not. And by all appearances they had reason to hope. Norman Baker was the founder of the Baker Institute in Muscatine, Iowa. He was a flamboyant, medical maverick with a new cure for cancer. Always dressed in a white suit and a lavender tie, he owned a radio station in Muscatine with the call letters KTNT, which stood for Know the Naked Truth. He took to the airwaves and declared war on big business, and the American Medical Association. He believed that organized medicine was corrupt and chose profits over patients. He preached the Gospel of alternative medicine. He was the self proclaimed champion of the common man against the ownership class. He was on the Tunis’s side and he had a cure. It is doubtful that John and Lula could have known much about the background of their ostensible savior. That he was a former vaudeville magician, turned inventor, turned millionaire business man, turned populist radio host, turned Cancer doctor without a day of medical training in his life. They couldn’t have known that Norman’s magic elixir was nothing more than a useless mix of watermelon seed, brown corn silk, alcohol, and carbolic acid. They clearly didn’t know that all Norman Baker had to offer was an excruciating, pseudo-treatment and a betrayal of their last hope. But in time they learned. Lula was dead by Christmas. That was how Norman Baker wanted the world to see him. As a crusader who fought to protect the common man against exploitation. But behind the mask of humanitarianism was a man who leeched off the sick and dying to make hundreds of thousands of dollars. Although tragic, Lula’s story is far from unique. It could be interchanged with hundreds of other desperate cancer sufferers who came to Norman Baker looking for a cure but found only suffering and death. It was the way of things at Baker’s Hospitals in Muscatine, Iowa, and Eureka Springs, Arkansas for nearly a decade. Norman Baker was born on November 27, 1882, in Muscatine, Iowa. He was the youngest of 10 children. In 1898 at the age of sixteen Norman quit high school to take a job as a machinist. For a few years he traveled from town to town working as a die and tool maker where he could. Then one night Norman saw a “mental suggestion” magic show by a performer named “Professor Flint.” Norman was captivated by Flint’s abilities, and resolved to start a similar show of his own. After a few false starts Norman got his performance troupe off the ground in 1904. The star of his show was a mind reader with the stage name “Madame Pearl Tangley.” The show was a hit, and found an audience on the vaudeville circuit. According to Norman’s biography the show drew 300 a week. In 1909 the original Madame Tangley decided to quit the troupe. A college girl named Theresa Pinder replaced her, and a year later Norman and Theresa married. The show continued for another four years until the summer of 1914. Mr. and Mrs. Baker found themselves in Muscatine again for a long break from the show. They had intended to go back out on the road again in the fall, but fate intervened. While tinkering in his brother’s machine shop that summer Norman came up with an innovation for a new kind of organ, called the Air Calliaphone. It was played with air, rather than steam, making it much more efficient. He sold the first one for $500 dollars (just under $10,000 in today’s money). He made two more and sold them immediately. Suddenly the “amusement” business didn’t seem so attractive anymore. He decided to quit altogether and manufacture his new invention. It soon made him a wealthy man. 1915 was a year of big change for Baker. He quit the theatre business, divorced his wife, and became a full time manufacturer. At its height, this business pulled in $200,000 a year. In 1920, Norman opened an art correspondence school, called the Tangley School. He freely admitted that he could not draw at all himself. But that didn’t stop him from netting over $75,000 in three years ostensibly teaching other people to do it. The city fathers gave Norman what he wanted. He promised daily talks about Muscatine to publicize it in the hope of luring new industries and employers to the sleepy Iowa town. “It’ll lift Muscatine from being a little burg lost in the Mississippi corn fields to a city the whole world knows about,” Norman promised. On Thanksgiving Day 1925, KTNT took to the air for the first time. Norman understood the natural unease and distrust the rural population had towards urban big business. He came out swinging at them, framing the argument as little KTNT vs. the Radio Trust. He was fighting for “the freedom of the airwaves,” and his message resonated loudly with his rural audience. His broadcasts consisted of an interweaving of his attacks on the AMA, Aluminum Trust, and Wall Street and pitching his many mail order products. Norman grasped the power of radio quickly, recognizing it was a way to raise his own profile to unprecedented heights and sell more product. KTNT was only licensed for 500 watts but often broadcast at 10,000. In 1928 Baker legally received license to broadcast at 10,000 watts meaning his signal could reach well over 1 million homes. Norman had been a prominent man in the community for well over a decade, but the stature and influence his radio station gave him was exponentially larger than anything he had ever known. KTNT became one of the most prominent radio stations in the Midwest. On weekends and holidays thousands would gather at the station to hear Norman’s broadcasts. Baker welcomed the crowds with live entertainment as well as souvenirs, food, and cheap gasoline. All for a fair price of course. As KTNT’s popularity grew, Norman’s attacks on his usual targets became more vitriolic and personal. He made baseless personal attacks on prominent men he considered enemies. Accusing them over the airwaves of everything from adultery to drunkenness. This behavior began to turn people against him and there was a backlash of complaints against KTNT. Had Norman stuck to heckling all the bogeymen of rural America, like the American Medical Association, and Wall Street, he most likely would have lived out his days in Muscatine as a rich and prominent citizen. But in 1929 he chose a path that led directly to his own ruin. Norman became aware of a Dr. Charles Ozias, who was operating a cancer sanitarium out of Kansas City. Norman claimed that in the interest of the public good, he wished to investigate whether or not the Dr. Ozias cure worked. Over the KTNT airwaves he called for five volunteers to be treated in Kansas City, with Norman footing the bill. He soon had his five volunteers and sent them to Ozias for treatment for several months in the spring and summer of 1929. Norman planned to publish an article in the December 1929 issue of his new magazine “TNT” that related his findings. He asserted that using aluminum products, especially aluminum cooking utensils caused Cancer. He warned that cancer was not curable through operation, radium, and x-ray. His new cure used none of these. He referred to surgeons as “cutters.” Normans cure was non-surgical, a series of injections that would eat the cancer without harming the surrounding tissue. The public could now rest easy that there was someone who could cure cancer without carving them up. There was just one problem. His test patients were starting die. The first one passed on November 25th. In December “TNT” hit the newsstands anyway with the front page proclaiming “Cancer is Cured” over a smiling picture of Baker and two associates. Three days after Christmas the second test patient died. The third and fourth patients died in January and February. In March Norman reprinted the December TNT issue detailing the miraculous recovery of his five test patients. In May of 1930 the last test patient died and Norman reprinted the TNT issue again, without changing a word. He acquired the cure from Ozias in January of 1930 and opened the Baker Institute in Muscatine. The formula was a solution containing glycerine, carbolic acid, and alcohol, which was mixed with tea brewed from water melon seed, brown corn silk, and clover leaves. He used KTNT to advertise his new hospital. In March of 1930 he hired Harry Hoxsey, another infamous cancer quack to use Hoxsey’s treatment. Some found it curious that Norman would hire Hoxsey and his treatment if he already had a cure. However, Hoxsey’s hiring didn’t slow business at the Institute. In the calendar year of 1930 Norman made over $444,000 from Cancer sufferers alone, roughly the equivalent of 4.8 million dollars today. “In Iowa at Muscatine, over KTNT, broadcasts a business man named Norman Baker who is selling a cancer cure, with cigars and cheap magazines as side lines. His cancer cure includes the old Hoxsey fake, originally promoted in Illinois, and apparently now resident also in Iowa. This nostrum for cancer is boomed by Mr. Baker over his radio station KTNT, which can be heard almost anywhere after 11 o’clock at night. This is exceedingly proper since it is the time of night when many devious and doubtful ventures are promoted. Baker has even claimed that the American Medical Association offered him one million dollars for his cancer cure with the intent of forcing it from the market so that patients might be compelled to resort to surgery for the saving of their lives. The lie is so obviously false to any person of intelligence above that of a moron that it needs little thought to convince his hearers of its fallacy. Even if the American Medical Association had a loose million dollars lying around ready to be spent, it is quite certain that a number of better ways for spending it would occur to the trustees who are responsible for the funds of the association. What is Mr. Baker doing with the money that he is snaring from the pockets of sufferers with cancer and wheedling from the funds of chiropractors, naturopaths, nostrum promoters and other medical malcontents? A week later, Norman was again the target in a follow up story. “Norman Baker’s cancer cure quackery at Muscatine, Iowa has been dealt with by the Des Moines Register. Not only did this paper reprint the statement of the Journal relative to Baker and KTNT but also it made an investigation of its own which established the utter falsehood of the claims made by him in his radio talks. The medical profession, of course, needed no evidence, but a credulous public must be convinced by personal study. The investigation made by the Register revealed many deaths from cancer among the Baker clientele; it revealed the menace of Bakerism to be his vicious influence against modern scientific diagnosis and treatment and modern public health work; it brought to light a Baker who trims his claims to the winds that blow; To all of this what does Baker answer? Merely that he is being persecuted by the “Medical Trust”; that he is benefiting 25 percent of cancers, and that the Des Moines Register is cowardly, contemptible and dirty.” Does this sad old world after all afford any spectacle so terribly pusillanimous or so completely ignominious as an exposed cancer quack? Norman was livid. He struck back on multiple fronts. The following month He filed a $500,000 lawsuit against the AMA for libel and defamation. He went so far as to accuse the AMA of sending three assassins to KTNT to silence him. According to Norman, a gun fight ensued between himself and the assailants. He and Hoxsey wounded one of the thugs before he and his fellow gunmen made their getaway. Baker filed a report with police but nothing ever came of it, due to lack of evidence. Finally, in an attempt to sway public opinion against the AMA and his other critics, he held a public demonstration of his cure on May 12. An estimated forty to fifty thousand people came to Muscatine to watch Norman’s demonstration. He had sent out a call from KTNT to see an outdoor exhibition of his cure. His days of running his theatre troupe had taught him how to manipulate a crowd, and he warmed them up with stories of miraculous healing from former patients, who one by one gave their own accounts to the crowd. To allay fears that his cure was harmful, he drank an enormous dose of his cancer “cure,” and showed no ill effects. The main event was open air surgery on a sixty eight year old man named Mandus Johnson. One of the Baker Institute doctors ostensibly opened up the skull of Johnson while he was still conscious. Baker then applied his cure to what he claimed was cancerous brain tissue, and echoed the statement from the cover of the December issue of TNT. “Cancer is cured,” he said. Now that he had thoroughly won over his audience, Norman could turn to his real purpose. Damage control against the AMA’s attacks. He launched into a fiery diatribe against the medical trust. He charged them with choosing profits over patients and told the crowd the initials M.D. really stood for “More Dough”. Norman promised the people that he would not let up in his fight with “the Medical Trust” and reminded the crowd that it was them he was fighting for. The open air demonstration and his daily radio barrages combined to create a booming business for the Baker institute. New patients arrived daily hoping that Baker’s miracle was true. Patients like Lula Tunis. As the institute flourished, organized medicine turned up the heat on Norman. New articles appeared in the Journal of the American Medical Association. They even debunked the ostensible brain operation on Mandus Johnson as a hoax. Johnson had a condition that caused the inflammation of his outer skull “What the gaping crowd saw at the ‘demonstration’ was not the man’s brain, but the medullary portion of the man’s skull,” the article said. Beginning in 1931 things began to unravel for Norman. The AMA actively lobbied the Federal Radio Commission to revoke Baker’s radio license. In May of 1931 they officially refused to renew his license and forced him from the air. Norman’s suit against the AMA was ruled against him and his reputation took a beating. A steady stream of relatives and former patients testified in court and recounted Norman’s sins in public. Norman fled to Nuevo Laredo, Mexico to build a new 100,000 watt radio station that would be out of the legal reach of the Federal Radio Commission. Norman remained in Mexico until 1937, broadcasting from his station and trying to influence from a distance. He even ran a small cancer hospital there. But he grew restless. He returned to Muscatine, plead guilty and served a one day sentence for practicing medicine without a license. After an unsuccessful bid for Iowa’s senate seat, Norman left Muscatine for good. Having been run out of his home state, Norman moved to Arkansas. This time to the Ozarks and the town of Eureka Springs. There he bought a majestic Victorian hotel that had fallen on hard times. The Crescent hotel sat on a hill 2,000 feet above sea level overlooking the town nestled below. He called it a “Castle in the Air” and made it the new location of the Baker Hospital. Norman picked up where he had left off in Iowa. Running the same medical scams in the Ozarks that had made him hundreds of thousands of dollars in Iowa. According to one US Postal Inspector Norman was pulling in $500,000 a year in Eureka Springs. For two years, He thrived in there, but the clock was ticking on Norman. He was now a marked man by federal authorities. They quietly investigated him and in 1939 they closed in. After ten years of being hounded by the authorities and the AMA all it took to bring Baker down was seven letters placed in the United States mail advertising his services. Norman Baker was arrested by federal authorities and charged with using the mails to defraud. In January of 1940 Norman arrived at Leavenworth Federal Penitentiary to serve a 4 year sentence. One investigator wrote “Our investigation indicates that Baker and his associates defrauded Cancer sufferers out of approximately $4,000,000. Our investigation further shows that a great majority of the people who were actually suffering with cancer who took the treatment lived but a short while after returning to their homes from the hospital. We believe that the treatment hastened the death of the sufferers in most cases. It appears to us that the sentence of four years which Baker received and the fine of $4000 was an extremely light penalty under the circumstances.” He was no longer Norman Baker, millionaire business man, and cancer maverick. Now he was simply known as inmate 58197. Norman was released from Leavenworth on July 19, 1944. He retired to Florida and lived comfortably until his death in 1958. What made Norman Baker’s cancer cure charade so despicable is the human cost of his fraud. Hundreds of people who might have lived if they received legitimate medical care died because they put their trust in his cure. The common grifter swindles people out of their money. But only a monster would do so at the cost of their last chance at survival. So was Norman a greedy sociopath, devoid of conscience? Or was simply a delusional man who convinced himself that his cure really worked? After interviewing Norman, the Leavenworth psychiatrist concluded that he was delusional, and that Baker did not believe that he had done anything wrong. The 1886 Crescent Hotel and Spa is an architecturally significant work by architect Isaac S. Taylor from St. Louis, Missouri. World-renowned for his leadership in the execution of the Louisiana Purchase Exposition, he also designed a total of ten hotels during his career— nine of which were actually built. Only a few remain standing today. A modern classic design created by blending French Renaissance and Richardsonian Romanesque styles pulls many elements from Taylor’s other works, including the rough-faced, square stone work, the Roman arches over the windows and French doors, and the towers that create the penthouse level. However, the mix of various styles gives the Crescent a uniquely authentic style that sets it apart from Taylor’s other works. Not significant for design alone, the Crescent is the realization of General Powell Clayton’s desire to transform the Ozarks with the financial support of Richard Kerens. Before both of these men played significant business roles in this nation, they were learning how to follow orders, manage people and supplies, and stay alive in the army. Both advancing quickly through the ranks, they gathered skills they later used to build their fortunes and dreams. Out of the army, they helped build the nation’s railroads and played various political roles throughout their lives, both ending their careers as ambassadors to Mexico and Austria-Hungary respectively. The history of the Crescent Hotel is the history of Eureka Springs. The reason both exist is because of the water. More than 60 springs which bubbled up “healing water” in and around Eureka’s downtown area were visited by thousands of tourists in the late 19th century. Midwest businessmen, many who were in the railroad business, saw an opportunity to cater to a high-end clientele as well as fill railroad seats. In 1884 that opportunity commenced with construction of a luxury hotel that would overlook the water-rich valley below. The year 1854 brought pioneer doctor Alvah Jackson to the Basin Spring. After the waters healed his young son’s eye injury, Jackson began using the “healing water” in his practice. During the Civil War, Jackson treated soldiers from both sides. The Battle of Pea Ridge (March 1862) kept him busy. Staying in the area after the war, he invited Judge L. B. Saunders to seek relief from a leg sore at the healing waters. Within two months, his leg was healed and influential Saunders was sharing his miracle with all. The settlement was named Eureka Springs in the summer of 1879. News of the healing springs spread like wild-fire with claims to cure everything from baldness, female trouble, and hay fever to cancer. The dramatic increase in population and activity brought wealthy capitalists to the area. Many held positions in the Eureka Springs Improvement Company (E.S.I.C), an organization key to creating Eureka. The company’s intended market was those afflicted and suffering as well as the wealthy looking for a vacation. Born of their desires was the Crescent Hotel- The Grand Old Lady of The Ozarks. Opening May 1, 1886, the Crescent Hotel was completed by the E.S.I.C under the direction of General Powell Clayton. Costing $294,000, the hotel opened as a year round resort. Isaac S. Taylor was the architect commissioned to complete the hotel. Stone work specialists from Ireland were brought in to help. 18” stones were brought from the E.S.I.C quarry near Beaver and were cut so exact that the walls were fitted without mortar. General Powell Clayton’s time with the E.S.I.C came after an Army career. Enlisting in 1861, he began as a captain in the 5th Kansas Infantry. Moving from Kansas to Missouri to Arkansas, he exited the Army as a Brigadier General. Pivotal in the setup of the Republican Party in Arkansas, Clayton was elected the first Republican Governor of Arkansas on July 2, 1868. Shortly after becoming governor, Clayton became aware of Ku Klux Klan activities and goals. He began a full-scale investigation that did little to stop the assassinations of civil officials. He called for the organization of a State Militia to deal with the southern half of the state. Under his leadership, the Clayton School Law of 1868 provided free education to all children in Arkansas. He also ensured Arkansas met the requirements to have a state college established. In 1868 land-grant Arkansas Industrial University (which became the current University of Arkansas in 1899) opened its doors. To add to his successful career, Clayton was elected to the U.S. Senate and moved to Washington, D.C., where he spent six years before returning to Little Rock in 1878. He served as president of the Little Rock, Mississippi, and Texas Railroad for a spell before returning to Eureka in 1880. Back in Eureka, Clayton chartered the Eureka Springs Railroad with the E.S.I.C. Driven to see the railroad furthered and the town more easily accessible to potential tourists, Clayton, with the help of friend Richard Kerens, was able to get a Frisco Railroad line that had been laid as far as Seligman, Missouri to come to Eureka in November of 1881. Tourists were tired of the long winding trip up the wagon road to the Crescent and businessmen wanted a faster route. For nearly eighty years after the first locomotive steamed into town in 1883, travelers to the popular springs to drink and bathe in the ‘magic water’ were pulled up winding mountain tracks by those reliable steam engines. The line was renowned for its scenic route up wooded slopes, through narrow passes and tunnels, and along rocky creek beds. Thousands of gallons of the famous water went down on the first steam trains. The original railroad was a well-known classic of mountain engineering with its winding route along the dramatic cliffs and stone ridges of the Ozarks. With the railroad in place, Clayton went to help William McKinley and his bid for presidency. After McKinley’s election, Clayton was appointed U.S. Minister to Mexico in 1897—a position he held until 1905. Investor and railroad guru Richard C. Kerens was pivotal to the realization of the Crescent Hotel. Starting his career in the Army of the Frontier, he gleaned organizational transportation skills from his role as “wagon master.” From the Army he went on to run a successful livery business and, looking to expand his business, picked up contracts to deliver mail from Fort Smith to Van Buren. Soon he was taking passengers along the mail route and then expanding up to the Missouri Line. Not one to stay out of politics, Kerens was appointed Chief Deputy U.S. Marshal. With his political post completed, Kerens formed the National Bank of Western Arkansas with Logan H. Roots, Ellis S. Mitchell, Bernard Baer, Dr. E. R. Duval, and Arthur Gunther. People in the area realized the need for a safe place to keep their money and the demand made the bank one of the most successful in the state. Kerens picked up the contract for the Southern Overland Mail Service with investor friend Ellis Mitchell while still investing and playing a role in the Texas and California Stage Line, St. Louis Iron Mountain and Southern Railroad, the Cotton Belt, St. Louis and North Arkansas Railroad, San Pedro, Los Angeles Railroad, Los Angeles, Pasadena and the Glendale Railway, and the Texas and St. Louis Railway. When his friend Powell Clayton contacted him about the possibilities in Eureka Springs, he invested in the Eureka Springs Railroad and was on the board of the E.S.I.C. Kerens was one of the main financial investors in the Crescent Hotel. Kerens served as a member of the U.S. Intercontinental Railway Commission, Columbian Exposition, and was president of the Fifteenth Trans-Mississippi Commercial Congress. Towards the end of his career came his appointment as U.S. Ambassador to Austria-Hungary in December of 1909. World-renowned architect Isaac S. Taylor was commissioned to complete the Crescent Hotel. He was born in Nashville, Tennessee, and graduated from St. Louis University with honors in classical languages. He started out in the firm of George Ingrahm Barnett and later went on to open his own firm where he practiced for over 25 years. His designs were fashioned in the period of modern classic, combining French Renaissance and Richardsonian Romanesque. Designing offices, hotels, factories, and railroad stations throughout the U.S. and Mexico, he gained a reputation as a hard-working, honest architect who liked to tackle projects others avoided. His dedication and quality earned him the appointment of Chairman of the Architectural Commission and Director of Works for the World’s Fair of 1904. Taylor was second in command designing and executing the world famous attraction. His vision drove the project forward and attracted millions. He designed the architecturally significant Mercantile Club Building on 7th & Locust in St. Louis, the Rialto Building which is on the southeast corner of 4th & Olive in St. Louis, and he finished the Drummond Building at 4th & Spruce in St. Louis. He also designed the original Union Station Hotel at the northwest corner of 19th and Market in St. Louis. Similarities with the Crescent include the rough-faced stone block exterior, Roman arches, and a hipped roof with dormer windows. Concentric Romanesque arches are seen above many of the windows of the first floor of the Crescent as well as the Planters Hotel, which was opened in 1894 but later torn down. Stone walls, dormer windows, and Roman arches were many of the shared elements from Taylor’s designs. The...craggy woodland on the north crest of West Mountain was perfectly suited for their new business venture. Standing on the highest point of West Mountain, the hotel would tower above Eureka Springs like some architectural royalty overlooking its kingdom. The massive stone masonry structure on the hilltop would be reminiscent of the castles of Europe...it was designed and constructed for group travelers of the 1800’s as well as a mountain retreat for wealthy railroad executives and their families. Clayton supervised the building of the Crescent, bringing in stonemasons from Ireland to aid in the construction of the hotel. The five-story, fireproof building was a fortress elegantly furnished with the latest Edison lamps and electric bells as well as featuring a Waring sewage system and heat by steam through open grates. The fireplace is largely constructed of Eureka Springs’ marble and is highly polished…The unusual newell post and balustrade were completed out of native woods. At the foot of the main staircase in the basement there are billiard rooms. These…lead into a bowling alley under the promenade leading from the south porch. Outside, a park surrounded the hotel with tennis courts and gardens. In 1886, presidential candidate James Blaine spoke at the Grand Opening Gala of the hotel. For the next fifteen years, the hotel was operated by the E.S.I.C and was an exclusive hot spot for the elite. In 1896, famous orator and politician William Jennings Bryan addressed a crowd at the Crescent Hotel. In 1902, the hotel was leased to the Frisco Railroad for five years. Due to slow business in the winter, Crescent College opened and provided education to females until 1934. Many prominent families sent their daughters to study at the College. With a strong educational background in a time when few women were highly educated, these graduates held the tools to shape history. Mary Ella Lundy, a dedicated athlete and musically-gifted student, went on to become the Head of Women's Education and Physical Education for Women at the University of Georgia for 35 years. Her influence was so great that a one million dollar scholarship was set up in her name. Another graduate, Frederika Luce, went on to become the Art Supervisor for all the schools in the Emporia school district in Emporia, Kansas. Three years later, in 1937, Norman Baker purchased the hotel and remodeled it into the Baker Cancer Clinic. Charlatan by nature, inventor of the Air Calliaphone, promoter of the Madame Pearl Tangley Show, and claiming to have the “cure,” Norman Baker made millions in today’s dollars from cancer sufferers alone. He referred to the Crescent as the “Castle in the Air,” broadcasting over the radio that he could cure cancer without carving patients up. Although his treatments and medical theories held no significance in the medical world, he had the attention of the American Medical Association. His practices, treatments, and claims helped shape what cancer treatment should not entail. However, it was his method of gaining patients which led to his undoing. In 1940, he was jailed for mail fraud. During his running of the Crescent, Baker remodeled much of the hotel, leaving it lavender and equipped with an escape route from his first floor office suite through a hidden staircase. His office featured a custom six-sided desk that housed the work for his six businesses. In 1946, the hotel saw a new round of renovations with four new owners by the names of Herbert A. Byfield, John R Constantine, Dwight O. Nichols, and Herbert E. Shutter. Under new management, the hotel was restored and travel vacation packages with the Frisco Railroad brought new tourists to the area. Created with the political elite in mind from the beginning, the Crescent continued to beckon politicians through the years. On February 21, 1925 Claude Fuller, former mayor and U.S. Congressman from Arkansas’ Third District and Albert G. Ingalls, Eureka Springs Mayor purchased the hotel. In 1950, Senator Dale Bumpers celebrated his honeymoon at the Crescent. Returning home to the hotel he once owned, at the 1951 spring season gala opening, Claude Fuller, U.S. congressman and native of Eureka Springs, flew in from Washington, D.C. to be one of the guests of honor. In 1967, a fire attributed to bad wiring claimed the penthouse level and most of the fourth floor. In 1970, Dwight Nichols was the only living owner and the hotel was turned over to Resort Enterprises, Inc. Then, in 1972, the hotel was sold to Crescent Heights Developments, Inc., owned by four investors—Dr. and Mrs. Sam H. Kouri and Mr. and Mrs. Robert Feagins. The purpose of this group was to restore the Crescent to its former glory while modernizing the amenities. In phases, they restored the property and expanded facilities. It was during this period that supernatural occurrences were first reported. In 1980, reorganization brought Riverview Management of Arkansas, Inc. in as a general partner. Under the new management in 1985, Willie Nelson played to a sold-out crowd in the Crystal Ballroom and then Governor Bill Clinton spoke to an annual chamber banquet. The Wichita Federal Savings and Loan of Wichita, Kansas took possession in 1988 and then sold it to Gary and Carole Clawson. In 1997, current owners Marty and Elise Roenigk purchased both the Crescent and the Basin Park Hotel. Roenigk's retain Jack Moyer as General Manager to craft and execute the development plan. Announcing the dawn of its Second Golden Era in 2000 the Roenigks said, “In five years, we will return the Crescent to where it was 100 years ago.” With then Governor Mike Huckabee and his band Capital Offense headlining the celebration, renovations ensued. They renovated the hotel in phases in order to share the past with visitors and guests alike. The establishment of the Crescent brought development to Northwest Arkansas and the railroad to the Ozarks. A refuge to the sick and weary, a vacation for the wealthy, a place of learning for the privileged. The symbol that was the Castle in the Air is the predecessor to a region which is now one of the most successful in the country.